Late Pt. Satyapal ji, son of Late Shri Raghubir Dutt was born in 1898 in Hoshiarpur, India. 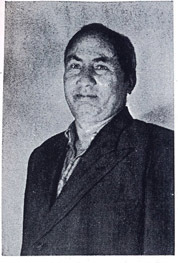 He obtained his education from Gurukul kangri and became graduate “sidhantalankar” in 1921. He commenced Ved Prachar under Arya Paratinidhi Sabha, Punjab. From 1922 to 1924 he lived in Burma (today myanmar) and was instrumental in strengthening Arya Samaj, Burma. In 1925, he returned to Punjab and continued serving Arya Samaj in various fields. He came to Nairobi, Kenya in 1927 and with his service minded benevolent personality won everybody’s heart but had to leave Nairobi due to his ill health in 1931. Babu Mathura Dass of Arya Pratinidhi Sabha E.A. invited him again to Nairobi in 1938. He also started evening Hindi classes at his own expense and his students exceeded more than 200 in number. We often read of stories of Christian and Buddhist monks, but life of Pt. Satyapal ji was a personified saint. He used to nurse the sick in the hospitals, save the needy and the abandoned natives in their cottages. The members of Arya Samaj and others had great respect for Pandit ji due to his selfless service towards humanity. He was known in the whole of Nairobi by “Pandit ji of Arya Samaj”. He contributed a lot in evolution of Arya Samaj. He had a friendly nature and was dedicated to the slogan of “Vasudhaiv Kutumbakam”. He would always visit hospitals to pray for the sick and jails to preach the prisoners that even today not only the members of Arya Samaj but he was like a father for the entire Hindu community. Many a times he lived in local African colonies and inspired them to become vegetarians, thus, many Africans became his disciples. Therefore even today he is remembered with great respect, by Arya pariwar and all those who had come in his contact. Pandit ji left for India due to certain reasons. The last Arya Pariwar who had seen him in his cottage at Haridwar was Mr. Suresh & Mrs. Sadhana Sofat. They had specifically gone to Haridwar to meet Satyapalji. The above photographs are with them at his 'kutiya' in Haridwar.